Make your Halloween party extra spooky—and delicious—with bloody truffles, candy corn popcorn balls, and so much more. Pretzel pumpkins have only three ingredients, can be made in 10 minutes, and will soon be your new favorite Halloween candy. 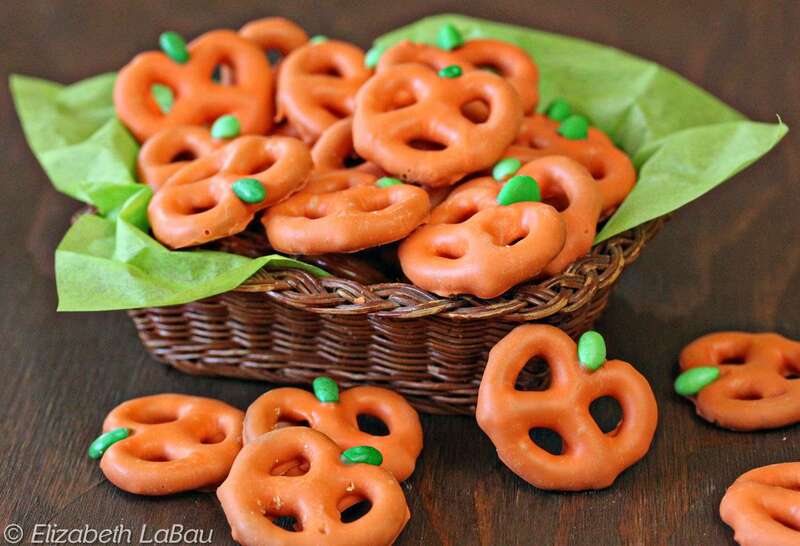 Dip mini pretzel twists in orange coating, top them off with a small green candy, and you've got yourself one tasty pumpkin patch. These delicious ghouls are riding on crunchy pretzel broomsticks for an extra-spooky Halloween treat. If you can't find large pretzel rods, use lollipop sticks or wooden craft sticks as a non-edible alternative. These stuffed pumpkin truffles are glossy chocolate confections filled with a rich, fluffy chocolate truffle mixture, topped with a few Halloween candies, and a pinch of sprinkles. Sweet and gooey popcorn balls are the perfect Halloween treat! You won’t believe how easy it is to make them using melted marshmallows, popcorn, and candy corn. The moist pumpkin cupcakes are spiced with a blend of cinnamon, ginger, and nutmeg. They get extra texture from chopped walnuts or pecans. Witch finger pretzel rods are one spectacularly spooky sweet-and-salty snack. It takes just 15 minutes and four ingredients to make these ghoulish candies. Cocoa and cinnamon pair with pumpkin to make a moist and rich chocolate pumpkin cake. Frost this flavorful bundt cake with an orange-tinted vanilla icing or simply dust with powdered sugar. A simple four-ingredient recipe for monster clusters, this treat is made from potato sticks dipped in chocolate and topped with colored candy "eyes." Need a last-minute dessert for a Halloween party? Use boxed brownie mix and your favorite Halloween candies to whip up these festive treats in no time. We love using mini marshmallows, candy corn, and chocolate chips, but a little creativity never hurts—especially when there's candy involved! These pumpkin-shaped truffles are bursting with flavor from pumpkin puree, cream cheese, cinnamon graham crackers, and plenty of spices. The cream cheese flavor gives the adorable little balls a bit of a pumpkin cheesecake flavor. Just three ingredients—candy corn, peanut butter, and chocolate—are combined to produce bite-sized candy bars with the crackly texture and bold peanut butter taste of a Butterfingers. It's downright magical and it's a great way to use up leftover candy corn after Halloween. Meatball monster sliders are great for a kid's party or Halloween night dinner. Topped with olives, the meatballs are simmered in spaghetti sauce and look just like eyeballs peeking out from their toasted rolls. Toss a salad with these cajun spiced pumpkin seeds, sprinkle them over a chicken entree, or serve as a spicy-savory snack at a Halloween party. Crunchy, sticky toffee apples get a bloody red makeover that's perfect for Halloween. It's a hoot to create these cute little owls. Just frost the cupcake, turn it upside down, and use halves of chocolate sandwich cookies, decorator frosting, and an M&M to make the face. Everyone will love the balance of salty, crunchy pretzels and smooth, sweet white chocolate in these spiderweb candies. If you don’t want to draw the spider in the middle of the web, you can place a raisin or chocolate chip in the center to represent the tiny bugger. 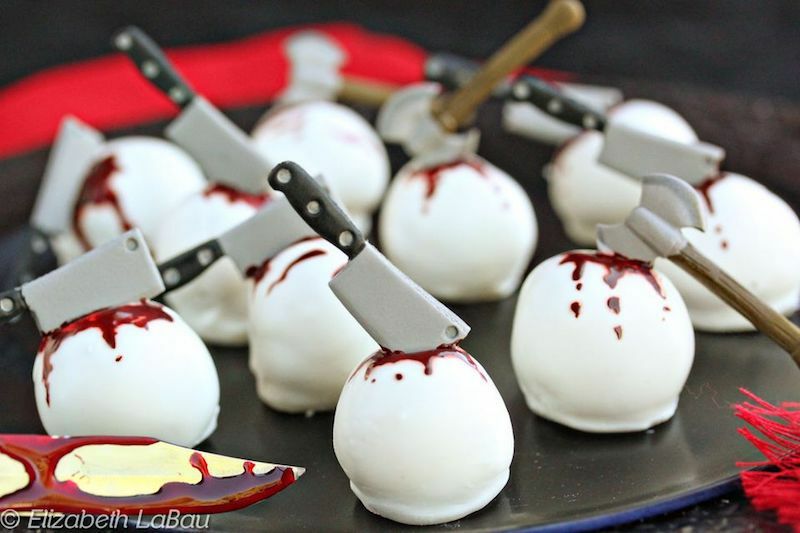 These gruesome truffles are bloody delicious! These cake truffles are skewered with edible royal icing weapons and painted with food coloring to create scary—yet sweet—party candy. Kids can pitch in to wrap these three-ingredient mummy dogs up with pre-made crescent dough.